A proteinaceous binding media for the polychrome terracotta army of Emperor Qin Shihuang has been identified using matrix-assisted laser desorption/ionization time-of-flight mass spectrometry (MALDI-TOF-MS). Methods for the preparation of the model samples and the elimination of interferences have been evaluated, as well as ageing processes. A method involving the complexation of EDTA in combination with dialysis was used to eliminate any interference in the polychrome layers taken from the historical samples. The model samples were aged by being buried in loess to replicate the ageing process of the historical samples as closely as possible. The optimum conditions for the extraction and subsequent enzymatic hydrolysis of the extracted protein were investigated. Under the optimized conditions, the “peptide mass fingerprints” of the proteinaceous binding media from the historical and model samples were determined by MALDI-TOF-MS. The results revealed that animal glue was used as the binding media for the polychrome layers of Emperor Qin Shihuang’s terracotta army. It also shows that animal glue used as binding media has a long history in China. The online version of this article (doi: 10.1007/s11434-014-0372-9) contains supplementary material, which is available to authorized users. This work was supported by the National Key Technology R&D Program of China (2010BAK67B12). 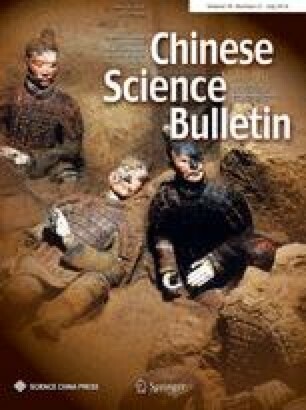 The authors are very grateful to Prof. Zhijun Zhang for providing the photograph of the polychrome warrior of Qin Shihuang’s terracotta army.